This is an awesome movie from my childhood - it was almost too scary to watch for a little kid! All of us girls really identified with...the horse! Yes, the little girl in the movie could talk to, and understand, horses - well, duh! Of course! Who couldn't?! How we loved Snowfire! I long to see this tension-filled movie with the great ending again. My all-time favorite movie about a horse! I always wanted a horse just like him. Ah, those times were so simple and uncomplicated. Every horse loving child, be it boys or girls should have a chance to see this movie. She actually didn't win Jim dandy, she won a pony that she couldn't have gotten as much use out of and so paid a little bit of money and got a little welsh pony. I have a photograph of her and Jim Dandy and I wish I could post here but I would have to find that first too. My best friend won the Snowfire coloring contest that the movie promoted. She won a pony and named him Jim Dandy. I still have the newspaper article around here somewhere. I loved that movie too! You'll find it on our list of horse movies. 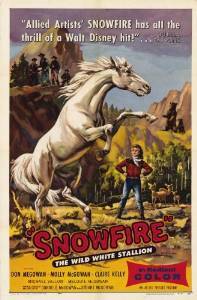 This was made in 1958... one of the very first horse movies I ever saw as a child, and was my favorite for years. Wow - I had a hard time finding out any information about this one. It looks like it was from 1958 and according to the description it's about a girl who finds a wild stallion. It stars Molly McGowan, Dan Megowan, and Claire Kelly. I couldn't find it for sale but I'll keep looking. It would be fun to see an old horse movie!